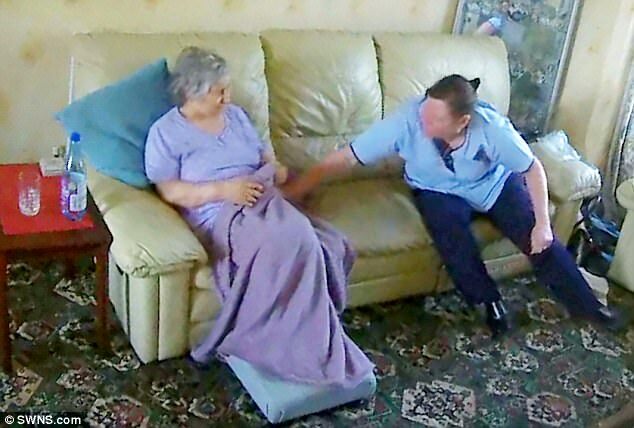 A CARER caught slapping a sobbing dementia patient on camera was let off with a caution. We have the moment a furious daughter confronts her mother's carer after catching her slapping the elderly woman. Stacey George was caught on hidden cameras abusing 78-year-old Sabina Marsden, telling her "God you stink" and snatching a blanket from her knee. But the family of the elderly woman have been left further enraged that the carer was only let off with a caution after being reported to police. Daughter Gina Owen, who watched the shocking abuse unfold as it was live-streamed to her mobile phone thanks to hidden cameras, burst into the room to confront the carer before firing her. Gina said: "Within ten minutes of my sister Mandy leaving the house I was watching it on my phone and she slapped my mum four or five times. "We only put the camera in because we thought she was being lazy. I didn't expect to see that, I was shocked. I felt sick." In the video, the Italian-born grandmother-of-two and widow can be heard saying "Mamma Mia" while George hits her five times while sitting on the sofa. Gina, 46, who works in a nearby electrical shop, is seen on the video bursting into the room to comfort her tearful mum while ordering George to leave. The carer scoffs the rest of her pudding before picking up her handbag and walking out of the room. The family took the video to the police but George was just handed a caution after she admitted assaulting Mrs Marsden on June 13 last year. Yesterday, Mrs Marsden's family released the video of the shocking attack to warn other families about George in case she is continuing to work as a carer. Gina said: "When I came into the house to see her, I came in so calm and just said, 'I'm sorry, I'm going to have to let you leave because I caught you slapping my mum on the camera'. "She asked how long it had been there and I said 20 minutes, half-an-hour. "We took the video to the police and expected her to be charged but she got off with a caution." Mega Care's chief operating officer Winner Lawal said George has since left the company, saying: "We are appalled and disgusted by the actions of this ex-staff member. "Of the 22 months that we cared for Sabina, this same staff member provided more than 96 per cent of the total visits. Sabina was the only service user cared for by this member of staff." A force spokesman said: "We can confirm that we investigated reports of an assault in Seagrave Street, Kettering, which took place on June 13, 2017. "After a thorough investigation and a review of all the evidence, a 46-year-old woman was issued with a police caution. "Safeguarding vulnerable people is a high priority for the force." Lauren Kennedy, of Seatons Solicitors in Corby, Northants., who act for Mrs Marsden and her family, said: "Sadly, cases involving the elderly and the vulnerable as victims of abuse and mistreatment are becoming increasingly common and it has never been more important for families of those receiving care to keep a close eye on their loved ones. "Mrs Marsden's family felt let down not only by Mega Care to whom they entrusted their mother's care but also the Criminal Justice System which saw the offender being issued with just a caution."